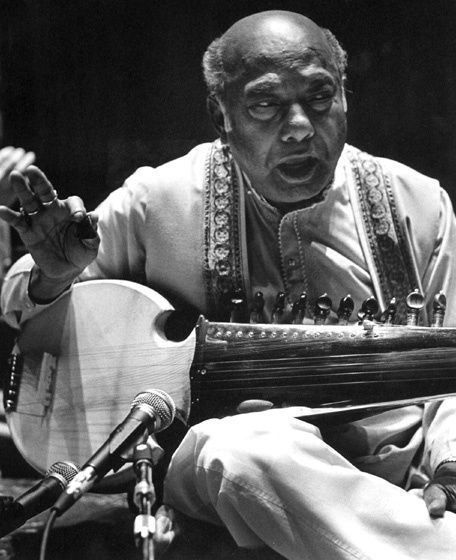 Ali Akbar Khan (Kahnsahib) was born in Bengal, India, in an area that is now part of Bangladesh. His family traces its North Indian tradition to Mian Tansen, a musical genius and court musician of Akbar, a Moghul emperor of the sixteenth century. Tansen is regarded as a rishi, or saint, who gave new life to the classical instrumental music of India. Ali Akbar's father, Allaudin Khan, was the chief disciple of Wazir Khan, a direct descendant of Tansen, and is acknowledged as one of the greatest figures in North Indian music in the twentieth century. A strict teacher, Allaudin Khan taught two of his children, Ali Akbar and Annapurna, and other celebrated Indian artists, including sitarist Ravi Shankar and flutist Pannallal Ghosh. 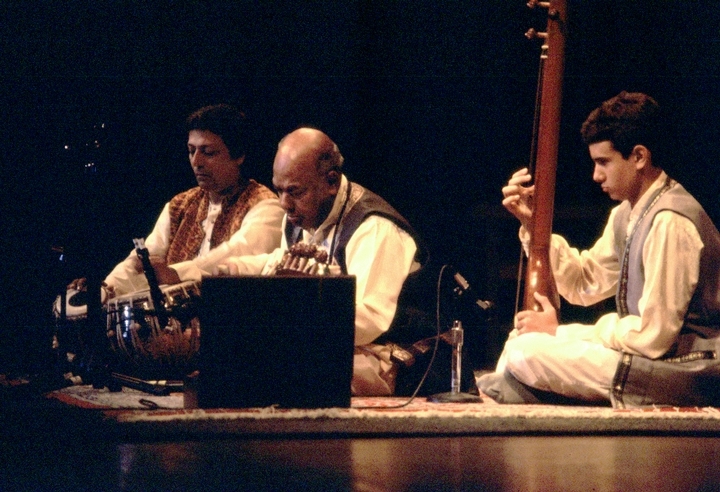 Ali Akbar began his musical training at the age of 3, under his father's tutelage, first learning vocal music, then studying drums with his uncle, Fakir Ftabauddin, and eventually being directed toward the sarod. The sarod is a twenty-five-string, lute-like instrument made of a teak or mahogany body with a goatskin hide stretched over it, and a metal fingerboard. Ten of the strings are played with a coconut-shell plectrum and fifteen are sympathetic strings, which vibrate while the melody is being played on the primary ten strings. The sarod has two resonating chambers that produce contrasting types of sound. Over the course of twenty years, Ali Akbar learned more than 75,000 ragas from his father. Ragas are the melodic motifs that are the basis of Indian music and have remained part of an oral tradition that is customarily passed along within families. The ragas are keyed to a particular time or day or year. Although they are a primary component of a disciplined improvisation, the musician must learn the techniques to improvise from them. 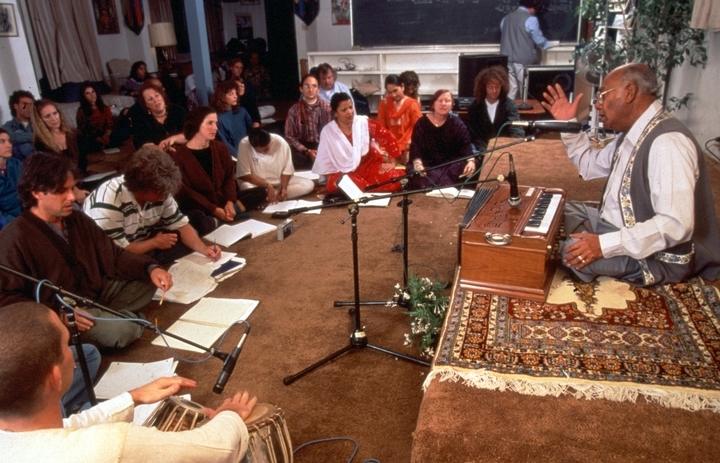 Like most Eastern musical traditions, Indian music is intimately connected with religious meditation and spiritual healing. Ali Akbar Khansahib (as he was properly called) gave his first public performance when he was 14. In his early twenties he became the court musician for the Maharaja of Jodhpur and was eventually conveyed the title "Ustad," the Persian word meaning "master musician." He first visited the United States in 1955, at the request of Yehudi Menuhin, and performed at the Museum of Modern Art in New York City. That same year, he also made the first American recording of Indian music and the first television performance of Indian music, on Alistair Cooke's Omnibus show. Subsequently, he toured extensively in Asia, Africa, Europe, Australia and North America. Performance highlights included the East-West Encounter in Tokyo and at Carnegie Hall and Town Hall in New York; the Festival of India at Philharmonic Hall; Expo '67 in Montreal; and the Berkeley and Monterey jazz festivals with saxophonist John Handy. In addition to being a prodigious performer, composer and recording artist, he continued the teaching tradition of his father. He settled in the United States in the early 1960s with his wife, Mary J. Khan, a tabla player. This is a drum that traditionally accompanies the sarod or sitar. His son, Alam, also became a noted sarod player. 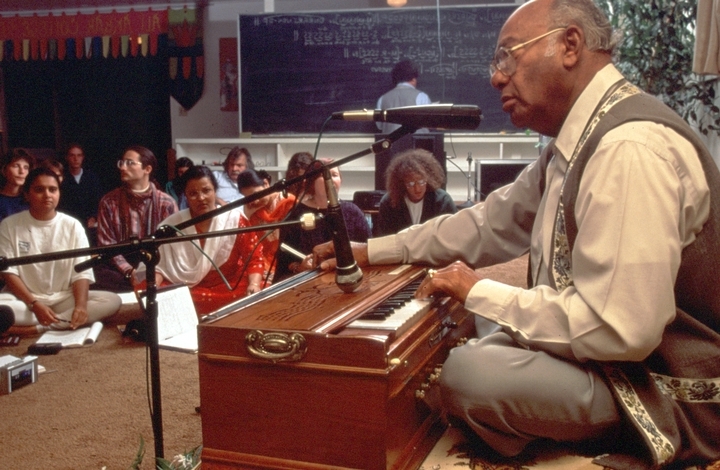 In 1967, inspired by the extraordinary interest and abilities of his Western students, Khan founded the Ali Akbar College of Music in San Rafael, California. Through the college, more than 7,000 American devotees have seriously pursued North Indian music. He continued to teach there nine months of the year, and during his annual world tour he also taught at the branch of his college in Basel, Switzerland. Learning the ragas and mastering the instrument are both difficult challenges. Ali Akbar said, "If you practice for ten years, you may please yourself, after twenty years you may become a performer and please the audience, after thirty years you may please even your guru, but you must practice for many more years before you finally become a true artist; then you may please even God." Bamberger, Bradley. "Honor for Ali Akbar Khan." Billboard (July 1, 1997). Hitt, Jack. "Night of the Living Geniuses." Esquire (November 1995) 124, 5: 92. Jenkins, Mark. 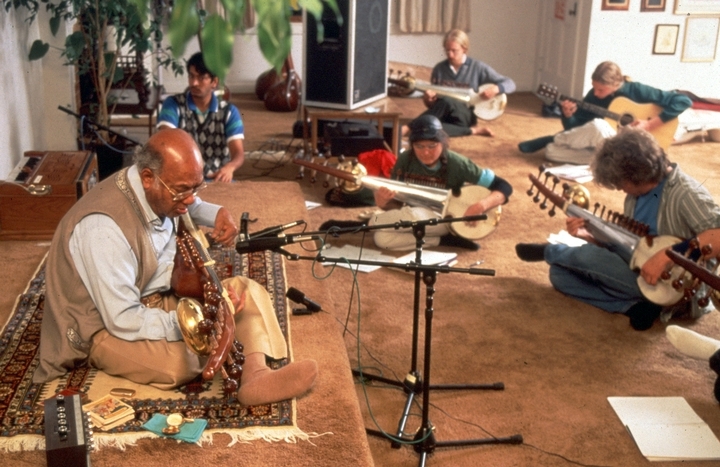 "Ali Akbar Khan: Rajah of Ragas; Master Teaches Music of India in Northern California." San Francisco Examiner (June 13, 1997). Maitra, R. "Song of India." UNESCO Courier (May 1991) 44, 3: 35. McLellan, Joseph. 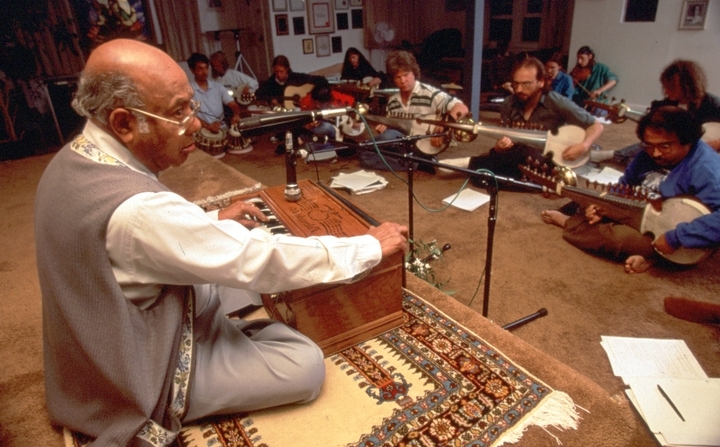 "Raga Riches from India's Ali Akbar Khan." Washington Post (August 18, 1997). Ratliff, Ben. "Father Leads Son Through Indian Complexities." New York Times (August 15, 2000) 149, 51481: E5. Sengupta, Somini. "Beatings and Worry in a Life of Music." New York Times (December 24, 1997) 147: E12. Khan, Ali Akbar. 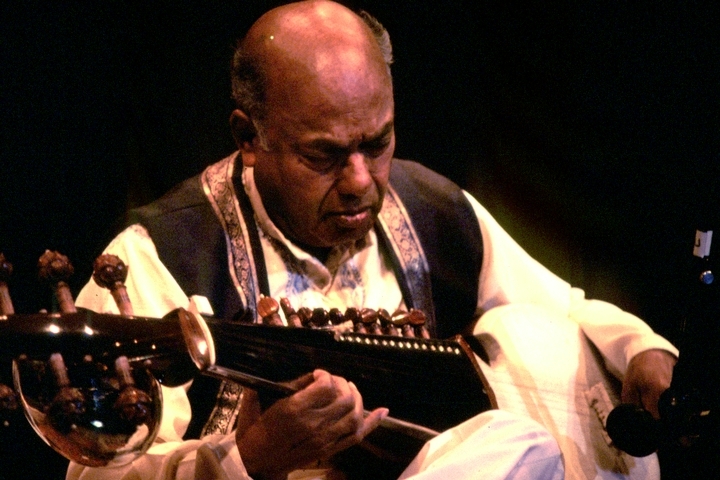 Ali Akbar Khan: Traditional Music of India. Prestige PRCD 24157-2. ______. Garden of Dreams. Triloka 7199-2. ______. Into the Mystic. Triloka 7213-2. ______. Legacy: 16th-18th Century Music from India. Alam Madina Music Productions/Triloka 7216-2. ______. Passing on the Tradition. Alam Madina Music Productions 9608.